The Hol Chan Marine Reserve located between Caye Caulker and San Pedro Town has increased in size following the launching of the expansion of the reserve. The inaugural event took place on Wednesday February 25th at the Hol Chan Marine Reserve office on Caribeña Street in San Pedro Town before a cross-sector of stakeholders. On hand for the official launching of the expansion were Belize Fisheries Department Administrator Beverly Wade; Minister of Tourism, Culture and Civil Aviation, Honorable Manuel Heredia Jr. and the incumbent Mayor of San Pedro Town, Daniel Guerrero. Hol Chan Marine Reserve was officially declared a reserve in 1987, and at the time included 18.1 square kilometers. In 2008, the reserve was expanded to include seabed, mangrove hatchery areas and grew in size up to 55.4 square kilometers. After five years of work, the marine reserve has expanded with the addition of 359 square kilometers of reef, sea, shoals, lagoon and wetlands added to the reserve. In his remarks, Hol Chan Marine Reserve Manager, Miguel Alamilla told the gathering, comprising of tourism and fisheries stakeholders, that the project was the brain child of San Pedro Tourist Guides Association, the Ambergris Caye Citizens for Sustainable Development, the Ambergris Caye Wetlands Committee and the Hol Chan Marine Reserve. “Through an integrated approach and with the full participation of the government agencies and stakeholders, we are happy that we accomplished what we started a few years ago,” said Alamilla. The expansion will include four additional areas. The largest of the four areas is Zone E referred to as the Bajos General Area. It will also be the largest of all eight zones that will now form a part of Hol Chan and accounts for a total of 330.6 square kilometers. 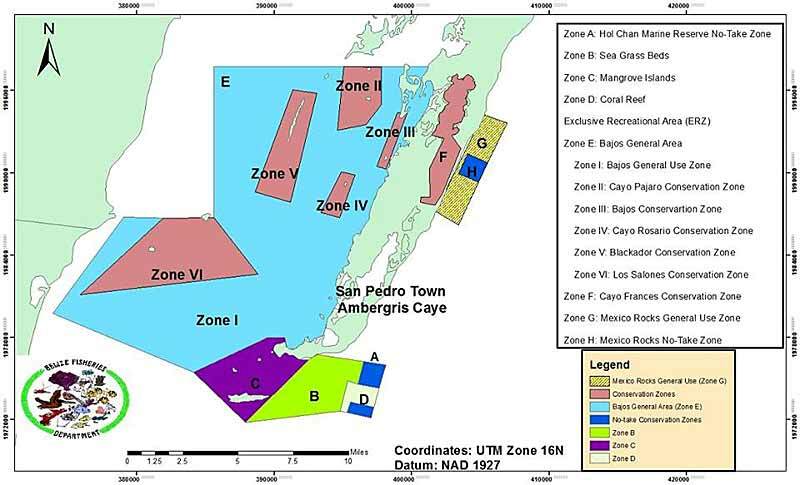 Zone E has been further subdivided into I – Bajos General Use Zone, II – Cayo Pajaro Conservation Zone , III- Bajos Conservation Zone, IV – Cayo Rosario Conservation Zone, V – Blackadore Conservation Zone and VI – Los Salones Conservation. Zone E borders the current boundaries of Hol Chan to the south and then runs along the leeward coastland of Ambergris Caye up to Bacalar Chico Marine Reserve. To the west and north, it runs up to the mainland near the Bomba Village Lagoon entrance then northwards to the Corozal Bay Wildlife Sanctuary. Zone G is considered the Mexico Rocks General Use Zone, comprising of 15 square kilometers. It takes into consideration seabed, reef and part of the sea. Within this zone is the smallest addition – Zone H – consisting of Mexico Rocks’ No-Take Zone. It is approximately one square kilometer in size. Only recreational activities will be allowed in the area, and no extraction of any kind of marine resources (alive or dead) will be allowed. While conservation is one thing, it also has a financial side as far as the use of the area is concerned. The area considered in the expansion of the reserve has been used for years by the over 400 tour guides of Ambergris Caye who take tourists on various daily activities free of charge. With the area now a part of Hol Chan, guides will have to add on a park-fee to the visitors wishing to use the area. According to Wade, that concern was raised in the early stage of consultation. “This was very well consulted with the stakeholders in the industry, because we realize the crucial role they play. We got very good support from the tour guides on the island. Yes, there will be some glitches, but we have the commitment from them to comply by the regulation. They were part of the group that advocated for the area to be placed under a reserve,” said Wade. From the management perspective, Wade told The San Pedro Sun that there will be the need to significantly increase the staff of Hol Chan Marine Reserve, as well the resources available to regulate the area. That by itself requires additional financial allocation. According to Wade, the initial cost of the first year of implementation stage will be done through a grant commitment made by the Protected Area Conservation Trust (PACT). “With this expansion, we have to look at the capacity to implement the expansion. That concern has been discussed by the board and we have the approval of a sizeable grant from PACT. We are also looking at integrating the fee collection and our revenue base will obviously expand and so that analysis has been made. That will allow us to hire more rangers to implement our program,” stated Wade. The grant commitment from PACT is the same $199,500 that was re-called from Hol Chan Marine Reserve last year when a deadline was not met for the approval of the reserve expansion. Zone A Includes the barrier reef and the fore reef. This is a no-take zone and only nonextractive recreational activities are allowed within this zone. Zone B The sea grass beds. This is the general use zone where fishing is allowed by traditional users only. Spear fishing and the use of nets is prohibited. Zone C The Mangrove wetlands. This area was set aside for the protection of the Mangroves. Sport fishing is allowed amongst the channels and flats. Zone D A special conservation area where fishing is allowed to traditional fishermen only except on the Exclusive Recreational Area of Shark Ray Alley. Zones are clearly demarcated with marker buoys. Institutions that share the responsibility for protection and surveillance include the Police Department, The National Coast Guard, the Fisheries Department, the Department of the Environment and the Forest Department. Currently, the HCMR has a staff of six Park Rangers who are responsible for surveillance and enforcement of the Reserve regulations. These Rangers work on a shift basis and patrol the protected area daily form six in the morning to eight at night. Random patrols are also conducted outside of the normal shifts assigned. Generally, users of the Reserve abide by the rules and regulations and Rangers just ensure that they are followed. Park Rangers are fisheries Officer and can enforce the regulations. Offenders are dealt with through the court system. The Fisheries Department has a prosecution unit that deals with all court cases . Hol Chan Marine Reserve is a marine reserve close to Ambergris Caye and Caye Caulker , off the coast of Belize . It covers approximately 18 km² (4,448 acres) of coral reefs , seagrass beds, and mangrove forest. Hol Chan is Mayan for "little channel". In the early 1980s fish stocks in the area around Hol Chan began to dwindle and at the same time tourism to the Cayes began to increase. Disputes arose over access to the Hol Chan cut, a natural break in the reef, which was a productive fishing area but also popular with snorkelers and divers . Proposed fishing bans were rejected and in the mid 1980s public consultation over establishing a marine protected area began. Reserve status was also called for by international organizations such as the New York Zoological Society (NYZS) and Peace Corps, due to the unique formation of the channel, the abundant fishery resources (including conch and lobster) and the feasibility of including an interlinked system of coral reef, sea grass and mangrove habitats in this area. Zone A which includes the inside and outside of the reef (part of the Belize Barrier Reef ). No fishing is permitted in this area, but snorkeling and diving are permitted on payment of a fee. Zone B covers the sea grass beds inside the reef. Both commercial and sport fishing are allowed in this area with a license. Zone C covers the mangroves swamps of southern Ambergris Caye. No commercial fishing is allowed in this zone, but sport fishing may be carried out under license. In 1999 the adjoining area of Shark Ray Alley was added as zone D of the reserve. This is a second charged snorkeling area, but commercial and sport fishing are permitted in some parts of this zone on obtaining a license. Nurse sharks and Southern stingrays are a draw for tourists. Zone A mostly consists of the Hol Chan Cut, a natural break in the reef. The cut is approximately 23 m (75 ft) wide and 9 m (30 ft) deep (Hol Chan is Mayan for "little channel"), and is rich in marine life. Around the cut the sea can be as shallow 1.5 m (5 ft). On the outside of the reef the channel slopes into the Caribbean , and on the inside of the reef tails off into the shallows. Zone B has Boca Ciega Blue Hole, a sinkhole, which opens into a larger underwater cavern. It is dangerous for inexperienced divers, so is not regularly visited. Zone D, Shark Ray Alley, is a shallow sandy-bottomed area inside the reef, unremarkable except that it is a gathering place for sharks and stingrays . It was an area traditionally used by fishermen to clean their nets before returning to port, and the abundance of food that entered the water as a result attracted the sharks and rays to feed. The presence of these fish was actively encouraged as a tourist attraction — being fed by local tour guides; the shallow clear waters make it an ideal spot for snorkelers to observe the creatures.